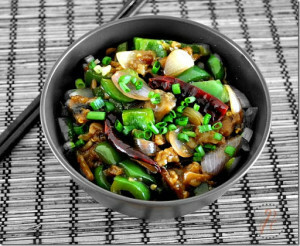 Chilli Mushroom is a classic Chinese dish that is inspired with the Indian ingredients.I have already posted the Chilli Paneer Recipe with paneer and green chilies,however i want to make slight variation for chilly mushroom,so i have added dry red chillies. 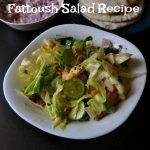 It makes a great appetizer for parties and very easy to make as well. Before proceeding to the recipe do check the Post how to clean Mushroom in easy way. Slice the onion separate it,break the dry red chilli,dice the bell peppers,chop the garlic and spring onions. Clean mushroom and dice it. In a mixing bowl add maida, corn flour, ginger garlic paste, pepper powder and salt.Pour water and mix well without lumps.Add the mushroom cubes into the batter and mix well,marinate it for half an hour. Make sure that Mushroom pieces are fully covered with this marinade. 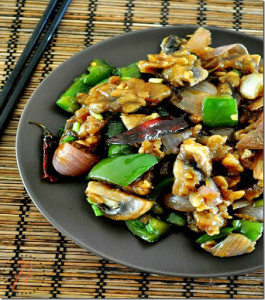 Heat oil in a pan,add marinated mushroom without any batter, reserve this batter for later use.Shallow fry the mushroom. Turn the other side also and shallow fry, till it becomes light brown.Once done drain the excess oil and take it out from the pan. In the same pan,add in the onion,garlic,bell peppers and chillies,saute it for few minutes till the onion becomes soft. Add sauce and salt.Saute them again for few minutes.Finally add the fried mushroom and saute well. Add a tsp of reserved batter,if you want as a gravy.Otherwise you can skip this step.Saute it till the gravy becomes thick.Once it becomes thick,remove it from the stove. 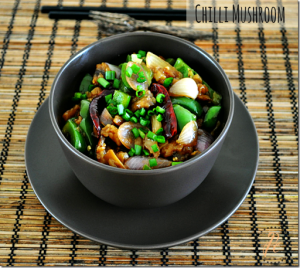 It goes well with fried rice and rotis.Do try this delicious Chilly Mushroom Recipe and Enjoy!!! 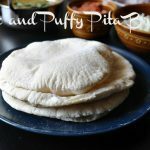 You can try this recipe with tofu or Paneer instead mushroom. If you want to make gravy add the reserved batter and a tbsp water.You can get the thick chilly mushroom gravy. With some fried rice aside, am ready to finish this delicious chilli mushroom rite now Prema,beautiful dish. like ur prop prema.. nice clicks too.. i like dry version.. Feeling hungry now… Y u make sooo good n tempting me always…. love the presentation and dish too. 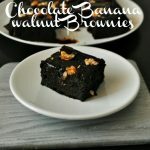 delicious and tempting recipe with an awesome presentation. 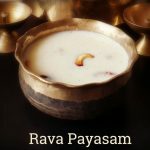 A classic party pleaser Prema! love the dry version of chilli mushroom,really looks very tempting!! Love your click of the chilli mushroom. Looks delicious. wow,very tempting appetizer ,looks yumm!! Delcious chili mushroom I can eat whole bowl now. nice way to add mushrooms.cute clicks. 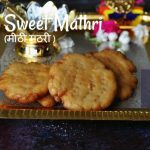 Awesome recipe and wonderful clicks !! healthy n yummy appetizer, looks really tempting.. I am not a mushroom person but this looks inviting, maybe I will try with paneer. looks so delicious with nice clicks…. 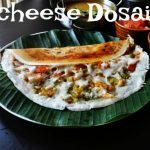 M very much wonder to seeing this similar recipe and its preparation method I do for myself! probably Prema and me, like cooking as our non formal way with taste! Appreciate prema! !